I'm back! 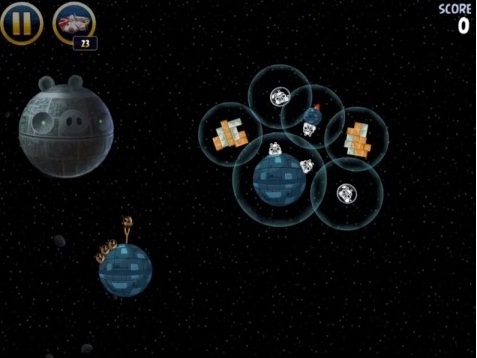 Another Angry Birds Star Wars guide. This time, we start off with level 2-7! In this level, you are given four birds. All four of those birds ate Obi-Wan Kenobi. Now, Obi-Wan Kenobi is really good with the force. 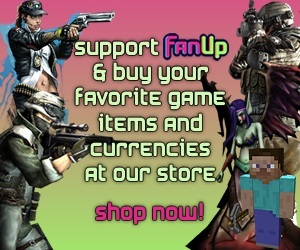 Your goal is to take down five enemies. All five of the enemies are Pig Troopers. Now, there are six force fields. In the first force field, there is just a bunch of metal and wooden blocks. The force field under that, you will see a planet where there are two Pig Troopers resting upon it. Under that force field, you find a Pig Trooper inside of a bubble. If you go above that force field, you find another force field with just metal and wooden blocks. 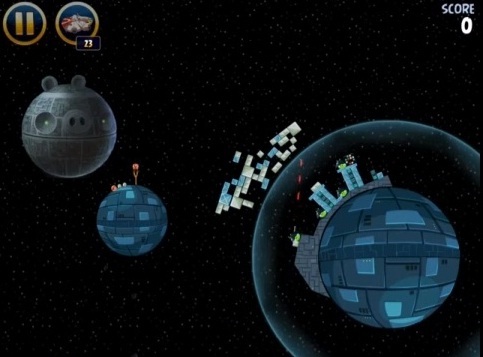 Above that force field, there is a small planet with one Pig Trooper on it. In the last force field, you see another bubble with the last of the Pig Trooper. You first need to send Obi-Wan Kenobi into the first force field with the metal and wooden blocks. Use Obi-Wan Kenobi's ability, which is the force, to send the metal and wooden blocks flying between force fields. You should knock down most of the Pig Troopers. You then need to send in another Obi-Wan Kenobi under the planet in the second force field. He will go flying into the fourth force field, the one with the other metal and wooden blocks. Then use Obi-Wan Kenobi's ability to send the metal and wooden blocks flying. This should knock out the ending of the Pig Troopers. The score I got was 53,820 points which was enough to give me three stars. Although I got that score, the minimum amount of points you would need for three stars is 53,000. So, I barely passed up this level. Next, we are on to level 2-8. In level 2-8 you are given four birds. Two of those birds are Luke Skywalker. We haven't had him in a level for a while. The other two of the birds are Bird Pilots. Your objective is to take down four enemies. All four of those enemies are Pigs with Helmets. There is a single force field. Outside of the force field, you will see a bunch of metal and glass blocks. Inside of the force field is all of the Pigs with Helmets. Three of them are kind of barricaded, but not really. 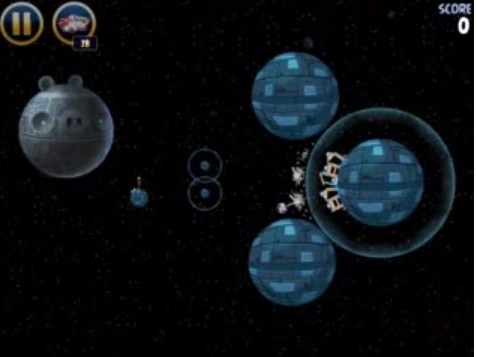 The last of the Pigs with Helmet is on the side of the planet with a blaster. To beat level 2-8 you need to first send Luke Skywalker send Luke Skywalker into the large metal square-ish block. DO NOT USE THE LIGHTSABER. This will only damage the blocks, and ultimately lead you to losing the level. After that, you should send the Bird Pilot to the northern part of the blocks that remain, since you sent Luke Skywalker straight down the middle. Anyways, the blocks should go down and crush the remaining of the Pigs with Helmets. You can or cannot get lucky. Hope to get lucky and the blaster bullets will deflect off the falling blocks and hit the Pig with Helmet that contains that blaster. I got lucky. Using this technique, I got a score of 56,400 points which gave me three stars. Although I got that score, the minimum amount of points needed would be 55,000 points for three stars. This will add three stars on to your total for Death Star. Lastly, we are on to level 2-9. In this level, you are given three birds. All three of the birds you were given are all Bird Pilots. Now, with the Bird Pilots, your objective is to take down seven enemies. Six of those enemies are Pig Troopers. The last of the enemies is a Oink Fighter. Now, there are three force fields. The first force fields surround two planets in the middle of the level. The last force field can be found at the far back of the level. Outside of the force field, is a bunch of debris. On top of one debris is a Pig Trooper inside of a bubble. Now, on the opposite side of the Pig Trooper, there is an Oink Fighter. Lastly, there, inside of the force field, are the final five Pig Troopers. They are all on top or inside of the structure on the planet. To beat level 2-9, which is SUPER easy, you just need to send the Bird Pilot into the battle. Aim straight between the two front force fields. The Bird Pilot should not be effected. Once you get out of the force fields, you should use the ability. The three birds should finish the level and bring all the debris into the force field and crash!! The debris should crash into the barricades and win the level because of all the destruction caused. Honestly, I destroyed all the enemies with ease on the first try. My score using this strategy was 72,240 points. Which was plenty enough for three stars. Although I got that score, the minimum amount of points needed for three stars is 69,000 points. So, I basically crushed that level! I hope you have as much success as I did there. Well this is the end of my guide. I sure hope you enjoyed it! 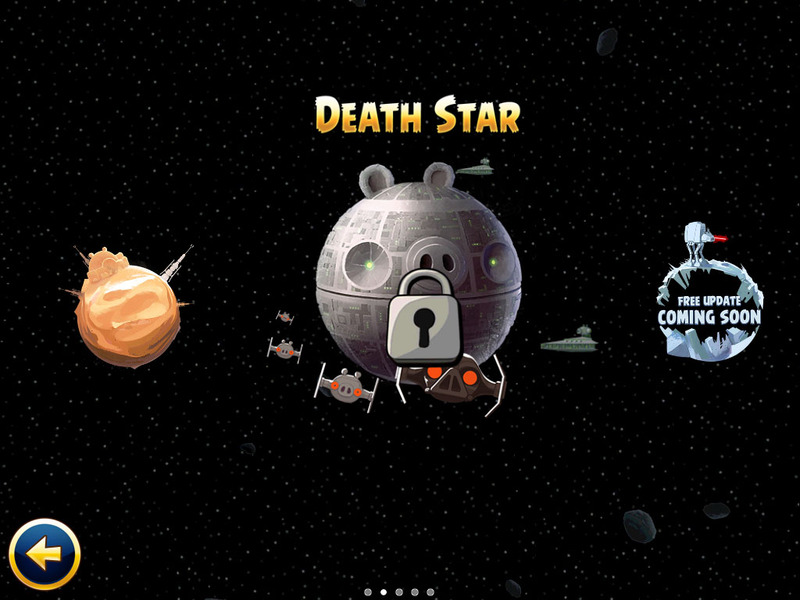 You should have a total of 27/120 stars for the Death Star world. This is a total of 22.5% done with the Death Star world!! This is spm8675309! Thank you for your time and enjoy! If you liked this guide, FAN it. Also, don't forget to check out my other guides!